In my house that means a new school year (yay!). Sports practices, piano lessons and homework mean extra juggling that I don’t have over summer. It’s always an exciting time of year, but I also feel a little more tension when Labor Day passes and the pace of life picks up. It’s like I’m on a merry-go-round ride that’s spinning faster and faster and I just want to get off. For a little. The new year for moms begins in fall. Fall is when we commit (or re-commit) to getting in shape or eating better. But how do we do this in the context of a busy life? For many years I listed out all of the things I needed to do and raced around trying to get them done. I got into the habit of starting my day with a few cups of coffee, ate whatever the kids ate (which meant lots of mac and cheese), had more coffee or something sweet at 3pm and ended it with a couple of glasses of wine to bring me down from my caffeinated high. I knew something had to change when little things started to irritate me because they were getting in the way of my To Do list! Of course we all need to get things done, but when I load up my To Do list and scramble to get it done, I’m prone to making these 5 mistakes. Snack foods and sports drinks sound good in theory, but almost every product on the grocery store shelf is calorie rich and nutrient poor. Most often we think about fat, protein and carbs when we eat. Some may even know how many “points” a food is worth. When it comes to health, we need to start thinking about micronutrients. That’s the vitamins, minerals, fibers, and phytochemicals in our food. Nutrient dense foods give our body what it needs. When we aren’t getting those vital micronutrients we set ourselves up for cravings! Being on the go often means having a long To Do list. This compels me to multitask and move back and forth between tasks, making it hard to gain momentum with any one task because I spend a lot of time (and energy) switching gears. Am I the only one that has piles of half-finished projects? Experts say our productivity drops 40% when we multitask. Ouch. Even talking on your phone while walking can prevent what you see in your surroundings from actually registering in your brain, something researchers term “inattentional blindness”. Needless to say, multitasking can increase stress, affect your memory, and lead to food cravings. One Iowa winter in my early twenties I had frequent headaches until a friend suggested drinking more water. Problem solved. Beside headaches, being dehydrated can cause bad breath, dry skin, muscle cramps and cravings for sweets. Being even slightly dehydrated can cause moodiness, problems concentrating, headaches and fatigue. All those people in the Starbucks line at 3pm may just need some water! Constantly being on the go means I have a lot on my mind and it’s tough to flip the switch at bedtime. And if I wake up in the middle of the night, my mind automatically starts thinking about the things I didn’t get done. String a few nights of bad sleep together and that spells trouble. Not only is sleep good for our attitude, but our bodies use the time we’re sleeping to reboot, detox, and repair. If we’re not getting all phases of sleep (because we’re waking up in the middle of the night, for example) our body isn’t doing the necessary repairs and memory consolidation. Our brain also can’t properly flush out toxic molecules when we don’t get enough sleep. And as you know, we tend to eat poorly after a bad night of sleep, because sleep is when appetite hormone regulation happens. Moms have the tendency to put ourselves last when something comes up. This often means skipping exercise, which I consider a form of self care. We all know self care is important, yet I read that 21 percent of women report that they’re not doing enough to relieve stress. All around, women don’t appear to be practicing self care regularly, with only 22 percent reporting that they sleep enough, 36 percent report eating healthfully, and just 29 percent feel they get enough physical activity. We deserve better! Perhaps we subconsciously hold the image of the busy, do-it-all woman as our ideal. I went into marriage thinking I could do it all – have a career, be a mother and an entertaining maven, thanks to Martha Stewart – because as the Enjoli commercial quipped, “I can bring home the bacon, fry it up in a pan, and never let you forget you’re a man”. Do you know anyone like this? If so, I’d love to meet her! I quickly realized when my first children were born (twins, yay!) there was no way I was going to touch that ideal woman. And yet I tried. For years. When I finally reached the tipping point, I was forced to scale back and take self care seriously. I hope you don’t have to experience overload before you take care of yourself. Want a quick game plan? We can’t stop life, so the bottom line is we’ve got to learn how to support ourselves. 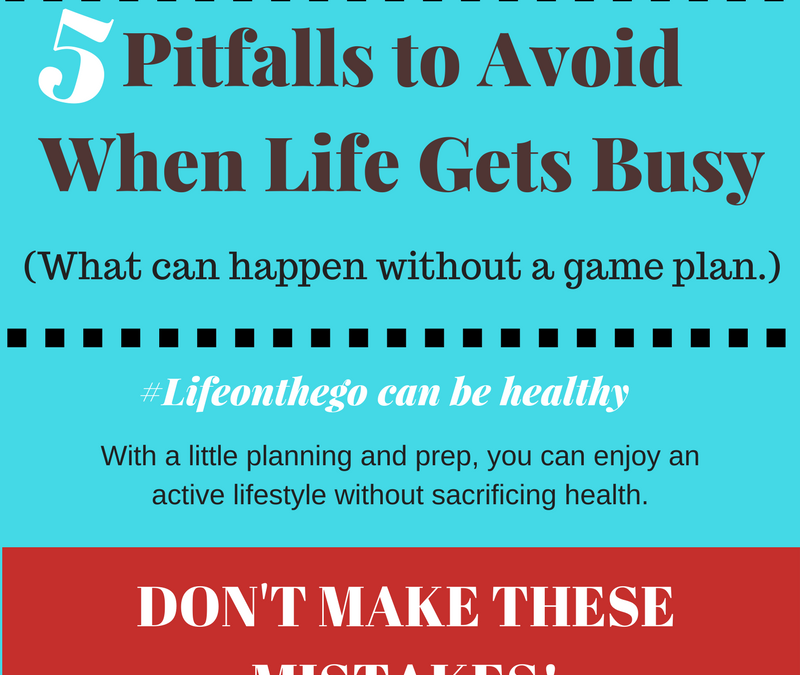 Having a game plan can help you avoid these pitfalls. And knowing other women are rooting for you is also a strong motivator. If you’re looking for an environment of supportive women who are active participants in improving their health, join my FREE Healthy Mommas Facebook group. And look for #lifeonthego on Facebook and Instagram for more ideas on ways to be healthy on the go. Do you struggle with overwhelm in the fall? I’d love to hear about your experience. Take the survey below and I’ll tailor a few strategies for you and give you a fun freebie! Click here to check out my upcoming workshops.